Haemorrhagia tityus alaiana Rothschild & Jordan, 1903, Novit. zool. 9 (Suppl. ): 451. 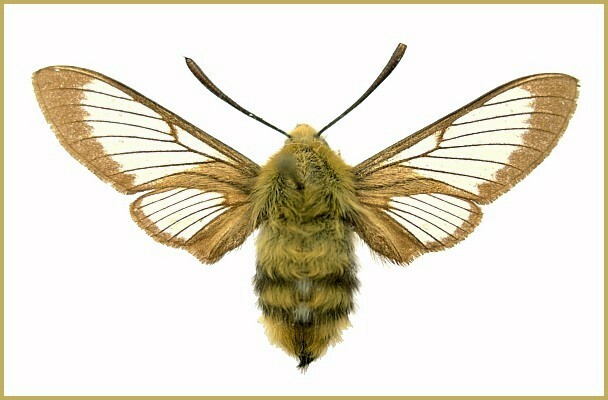 Hemaris (Mandarina) molli Eitschberger, Müller & Kravchenko, 2005, Atalanta 36(1/2): 201. (Taxonomic notes. (i) Derzhavets (1984) considered Hemaris alaiana to be merely a form of Hemaris tityus (Linnaeus, 1758), at best a subspecies. However, Eitschberger & Churkin (2002) quite rightly treated alaiana as a distinct species. Comparison of both male and female genitalia (Eitschberger, 1999) indicate that this species is related to the eastern palaearctic Hemaris radians (Walker, 1856), having evolved from an isolated population. Holarctic; western Palaearctic region. Pleistocene refuge: Monocentric -- northern section of Sindian refuge. Wingspan: 35--45mm. According to Rothschild & Jordan (1903), black belt of abdomen much shaded with yellowish hairs, tail scarcely with any yellowish hairs; thorax and posterior abdominal segments less bright yellow than in Hemaris tityus. Border of forewing noticeably broader than in Hemaris tityus, as broad between R3 and M1 as this cellule is wide at end; cross-veins with an obvious bar, which is nearly as prominent as in Hemaris affinis (Bremer, 1861). Base of hindwing above and below less yellow than in Hemaris tityus, border noticeably broader. Diurnal. An insect of montane meadows and woodland glades rich in flowers, where it flies with Hemaris fuciformis (Eitschberger, 1999). Generally found at 1400-2200m altitude. Early June to mid July (Eitschberger, 1999). Endemic to the Alayskiy Khrebat, Tian Shan, Dzhungarskiy Alatau, Saur and Altai Mountains, from Tajikistan (Rothschild & Jordan, 1903) and eastern Kazakhstan (Eitschberger, 1999) to western Mongolia (Yakovlev and Doroshkin, 2005; Yakovlev, 2011). There is also the possibility of a disjunct population in northern Jordan (Eitschberger et al., 2005) (see 'Taxonomic note (ii)' above)).